Littelfuse are a Chicago based manufacturer with a European office based here in Norwich. They manufacture a variety of electronic components such as switches and automotive sensors. The exhibition Electronica 2014, is the world’s leading trade show for electronic components, systems and applications; making it the perfect show for Littelfuse to attend. It was held in Munich, at the Messe Muenchen between the 11th and 14th of November. Not only did we travel to Munich and deliver the components ourselves, we stayed and actually constructed the stand for them too. The stand which we designed, printed, delivered and built has an area of 36 square metres and is 4 metres tall. It integrates show cases, corner towers for interactive displays, a store room and even seating areas. This new stand was in aid of launching their new product lines and the exhibition was a chance to introduce them. But they say a picture is worth a 1000 words, so have a look at the image below, taken prior to hand over (just in case you were wondering why there is plastic sheeting all over the floor). 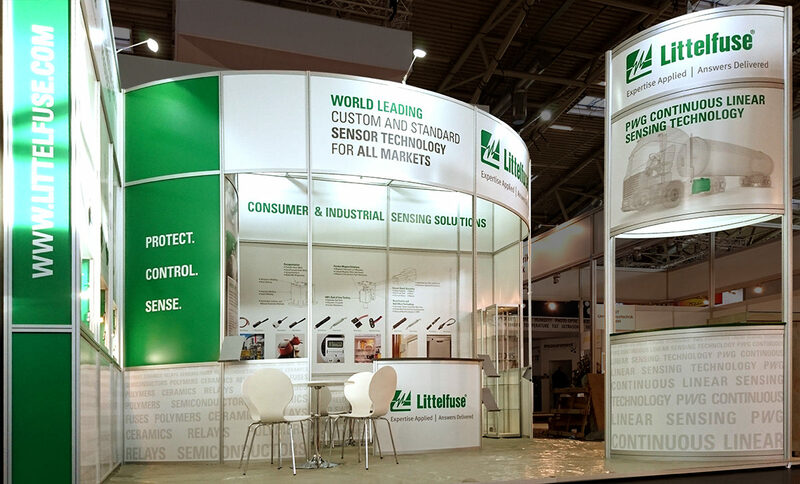 Littelfuse were thrilled with their stand, as were we. It’s fresh, modern and highlights the bold Littelfuse green. Rick and Jay (part of our exhibition team) have flown back out to Munich today to breakdown the stand and bring it back to the UK this weekend. No rest for the team though, as they get back to Norwich on Sunday night to unload on Monday morning before reloading on Monday afternoon. This time for the London Vet show where we are constructing a reconfigured version of an existing stand for Natures Menu, winners of Business of the Year and Business Development at the recent EDP Business Awards in Norwich.